In our lab, we take a “robophysical” approach to discover principles of effective interaction of ambulatory robots with multicomponent flowable substrates. We use robots as simplified model locomotors to test hypotheses and explore principles of locomotion. Below shows a sampling of our projects, including studies in robot walking, running, jumping, performing flipper-driven locomotion on homogeneous and heterogeneous granular media, and undulatory swimming within granular media. The earliest vertebrates to emerge from the water were not moving on solid, dry land, but rather yielding granular media like sand and mud. By examining the movement on granular inclines of mudskipper fish, a robophysical model, and a mathematical model, we showed that the tail improves locomotor performance in these substrates. The tail does not simply increase displacement, but rather expands the range of substrate and limb conditions which animals can traverse, reducing the risk of stranding and allowing early tetrapods to move robustly through their novel habitat. Tail use improves soft substrate performance in models of early vertebrate land locomotors, Benjamin McInroe, Henry C. Astley, Chaohui Gong, Sandy M. Kawano, Perrin E. Schiebel, Jennifer M. Rieser, Howie Choset, Richard W. Blob, Daniel I. Goldman, Science, 353, 154-158, (2016). 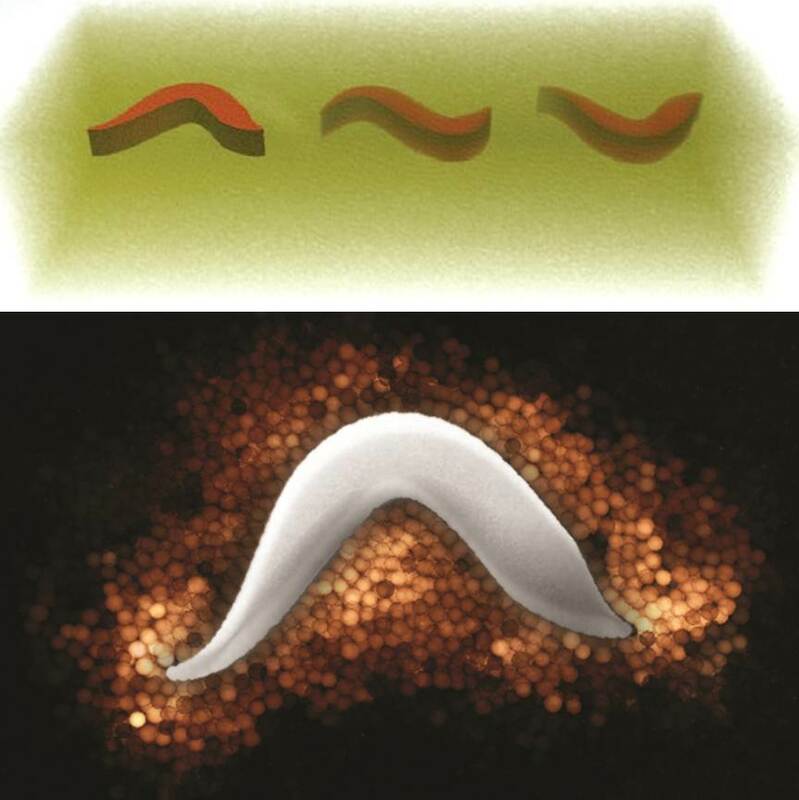 Inspired by the sandfish lizard experiments, we built a multi-servo driven robot with lycra skin capable of swimming sub-surface within sand by propagating a single period sinusoidal traveling wave from head to tail. 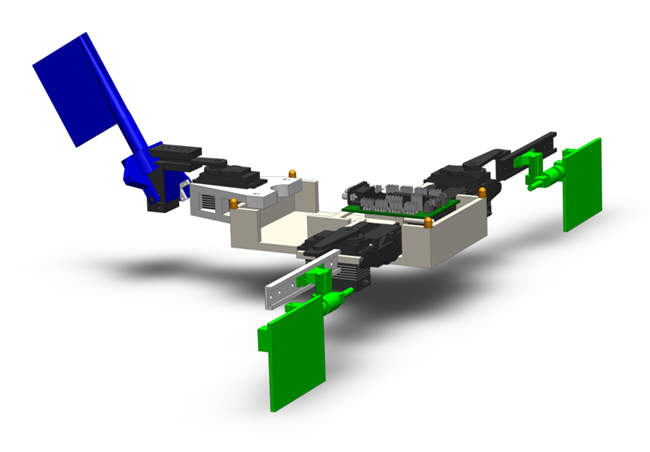 The robot increased its forward speed linearly with undulation frequency. The maximal forward speed of the robot corresponded to the same spatial characteristics as used by the animal. The dynamics of impulsive animal locomotion, like jumping, are interesting, because representative simple models such as a spring-loaded inverted pendulum produce rich and complex behaviors, even on hard ground. A systematic robot study of over 20,000 jumps revealed two distinct jumping modes, the single jump and stutter jump. 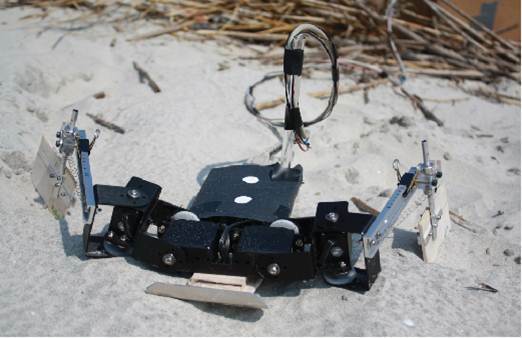 To systematically explore how heterogeneity affects legged robot locomotion, we developed an automated terrain creation system comprised of an air fluidized bed, tilting motors, and a universal jamming gripper to set the initial conditions of the ground, including sand compaction, boulder location, boulder burial depth. The kinematics of the robot are recorded and tracked in 3D by a high speed camera system. 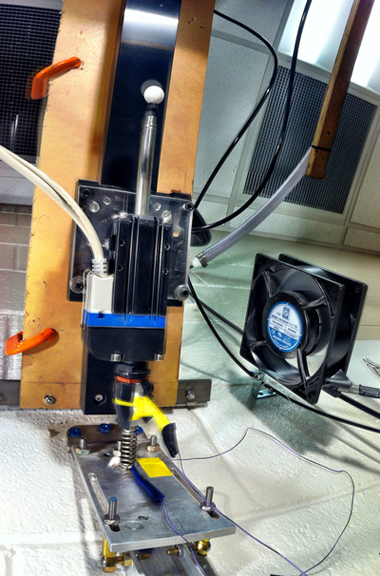 After each test, a universal jamming gripper retrieves and re-distributes the boulder and robot, while the fluidized bed resets the compaction of the fine sand. 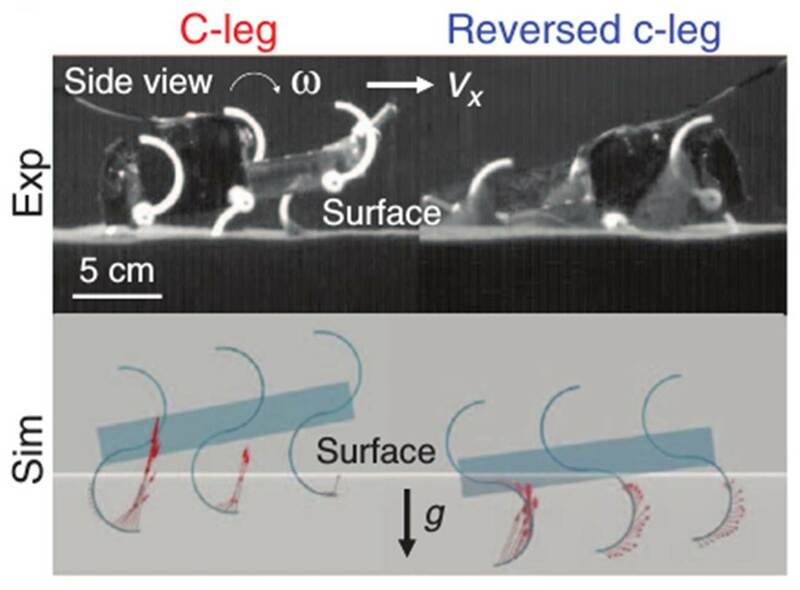 We study the locomotor mechanics of a small, lightweight robot which can move on a granular substrate of 3 mm diameter glass particles at speeds up to 5 body length/s, approaching the performance of certain desert-dwelling animals. GRF analysis reveals a change in propulsion mode. At low frequencies, the robot used a quasistatic “rotary walking” mode, in which the substrate yielded as legs penetrated and then solidified once vertical force balance was achieved. 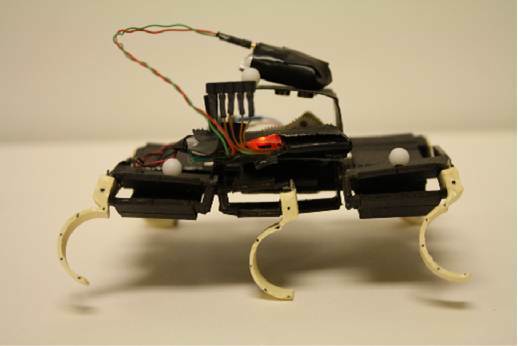 At high frequencies the robot propelled itself using the speed-dependent fluid-like inertial response of the material. We study a sea turtle inspired physical model to understand principles of limb-ground interactions of paddle-like appendages on GM. Our biological turtle study indicated that the flexible wrist allows high performance through solidification of the material behind the limb. We test this in the robot, monitoring speed and thrust force (measured by an on-board force plate). 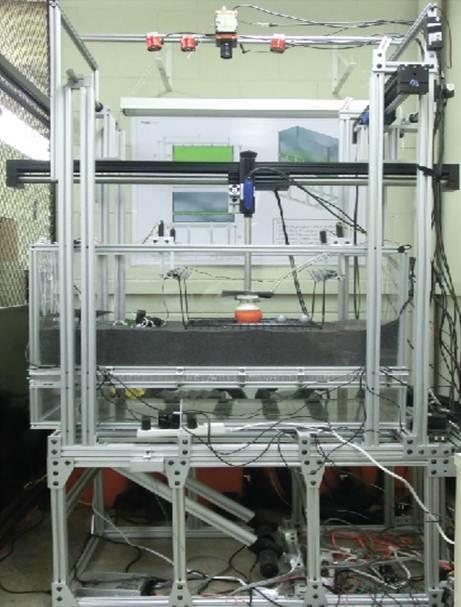 Apart from robotic experiments, in our lab we also perform extensive "robophysics" simulations. Simulations facilitate the systematic variation of physical grain and robot parameters which are otherwise difficult to vary in experiment. 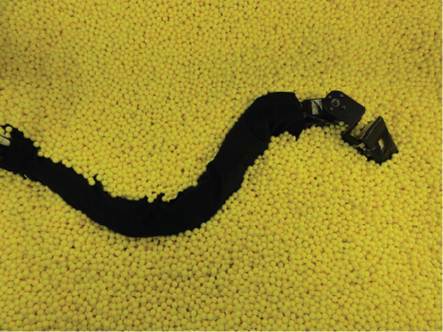 In addition, many important quantities, such as the interaction forces between individual limbs of the robot and the granular media, can be extremely difficult to measure in experiment but are directly obtained from simulation. An experimentally validated physics simulation produces qualitatively and quantitatively accurate predictions under a wide range of conditions and provides insight into the fundamental principles of robotic locomotion. We utilize a combination of DEM simulation, generalized "terradynamics" force relationships, and even simple 1D hybrid dynamics equations, all of which illuminate the rich dynamics of robot-ground interaction.